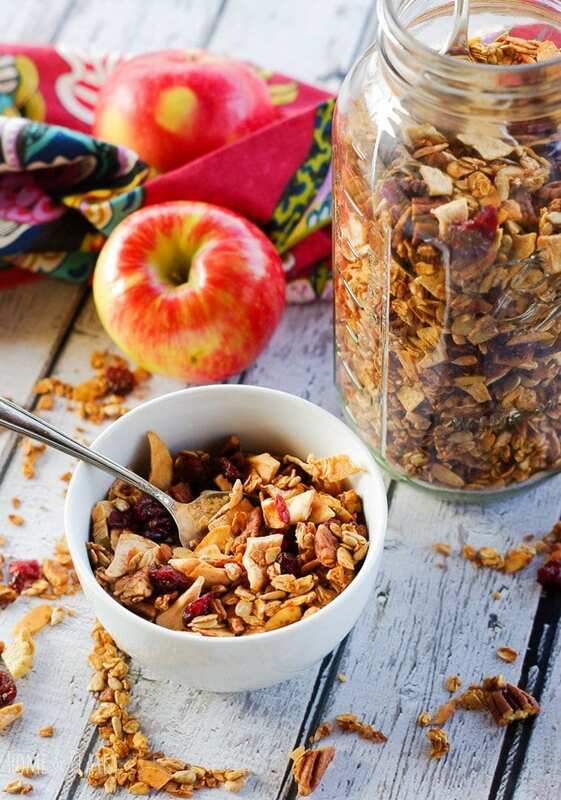 Chock full of crunchy oats, pieces of dried apple and cinnamon and spice, this granola tastes like fresh apple pie. It’s delicious as a snack on sprinkled on your morning cereal. [Updated] Can’t you smell it? The nutty spiced scent of my cinnamon apple pie granola warms the whole house. Cinnamon, nutmeg and clove swirl through my kitchen and everyone comes running! It reminds me of warm apple bake on a summer day. Or my homemade apple crisp on a cool fall afternoon. 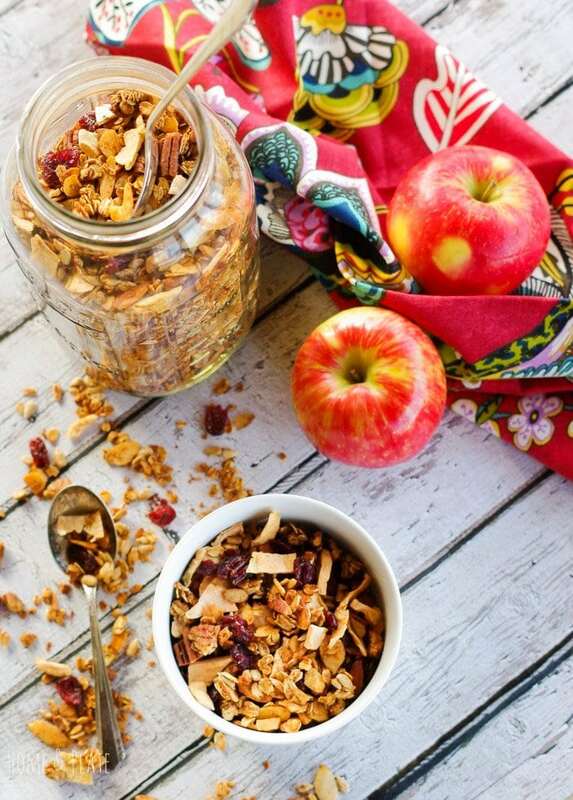 My cinnamon apple pie granola is delicious all year round. Don’t buy granola at the store! It’s so much tastier when made from scratch. And it cooks up in just over an hour. It is the perfect healthy breakfast and it’s gluten-free and completely vegan. While I love this granola on top of cereal or in yogurt it’s also delicious on its own as a snack. If your kids are like mine, sometimes they need a healthy power boost before their next athletic event. This fits the bill perfectly. 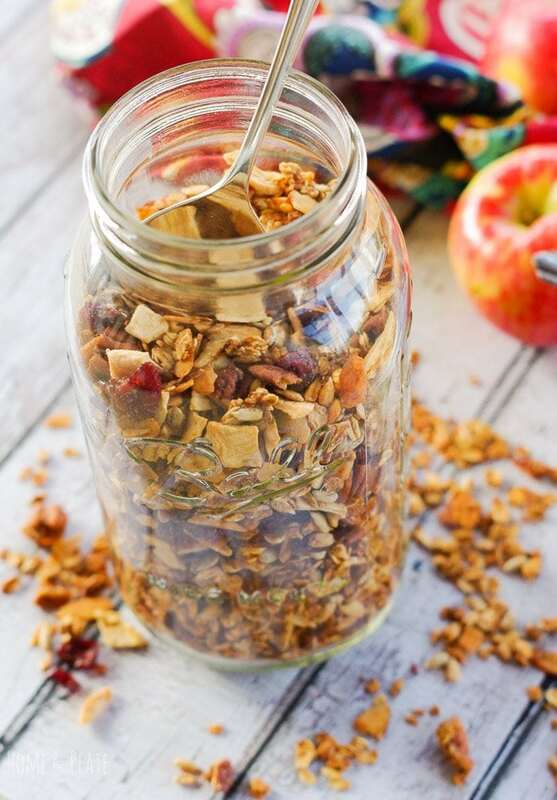 With swim and baseball starting up for the season, this homemade Cinnamon Apple Pie Granola is easy to throw in a zip lock bag and toss in the duffel bag. It’s loaded with protein and healthy grains. We’ve been trying to incorporate more healthy fruits, nuts and whole grains into our daily diets. This granola and my maple almond granola are regular staples in my kitchen pantry. The recipe ingredients are easy to find in your local grocery store. Check the dried fruit aisle for dried apples. One 2-ounce bag yielded one cup of chopped dried apples. I also added dried cranberries for a pop of sweetness and color. 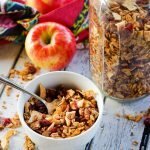 Chock full of crunchy oats, pieces of dried apple and cinnamon and spice, this granola tastes like fresh apple pie. It's delicious as a snack on sprinkled on your morning cereal. In a large bowl combine the oats, nuts, sunflower seeds, brown sugar, applesauce and maple syrup. Next, add in the cinnamon, nutmeg and cloves. Mix until well combined. Pour the mixture onto rimmed cookie sheets. Cook for up to 1 hour and 15 minutes stirring every 15 minutes. Remove from the oven when the granola is golden brown and add the dried apples to the warm granola. Allow the granola to cool before adding the dried cranberries. This looks just perfect! I want to make this now! It’s perfect for breakfast. Thanks for visiting. This is a super healthy and tasty breakfast or snack. I have to agree with you Peter. Thanks. Sounds delicious and yes we like to grab a handful and nibble away. 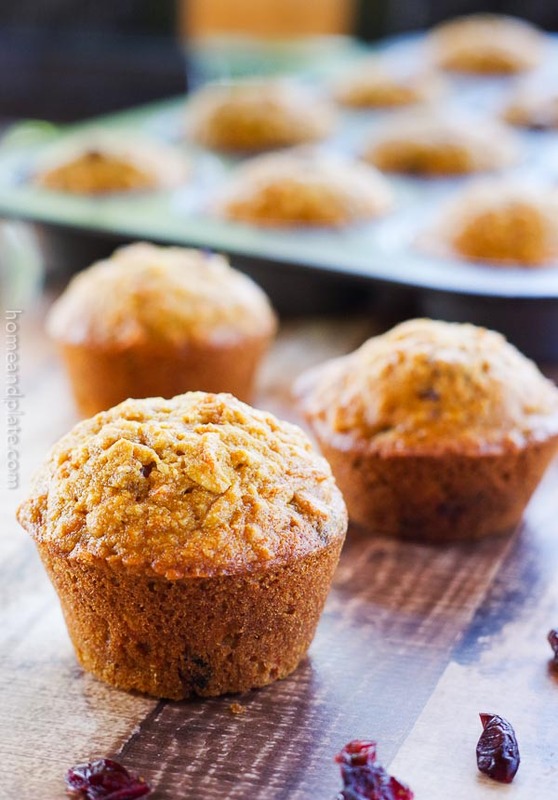 Great recipe and a great snack/breakfast to have on hand all of the time. It’s the perfect snack. Thanks so much. Homemade granola is the best! I haven’t tried making it with applesauce before, sounds delicious. This would make such a cute gift in a pretty jar with a ribbon, too! It would make a great gift. Thanks Amanda. Wow this granola looks delicious!! Saving to make for sometime this week! Thanks Sam…it’s great on yogurt or even sprinkled over baked apples. I’m crazy about granola! I like the idea of the maple and applesauce combination! 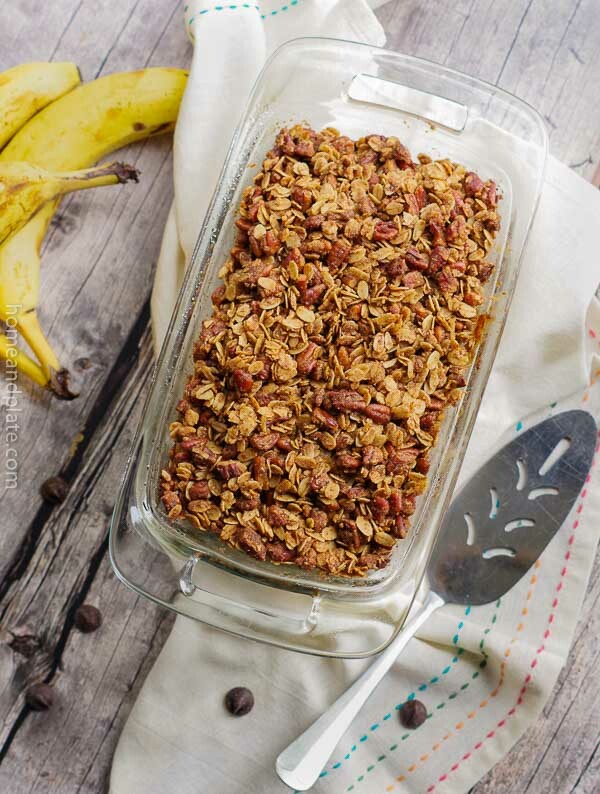 You photos are so gorgeous, pinning and sharing this awesome granola recipe! Thank you for sharing it, it really looks delicious! Thanks…I love granola…so good on cereal, yogurt and just on its own.